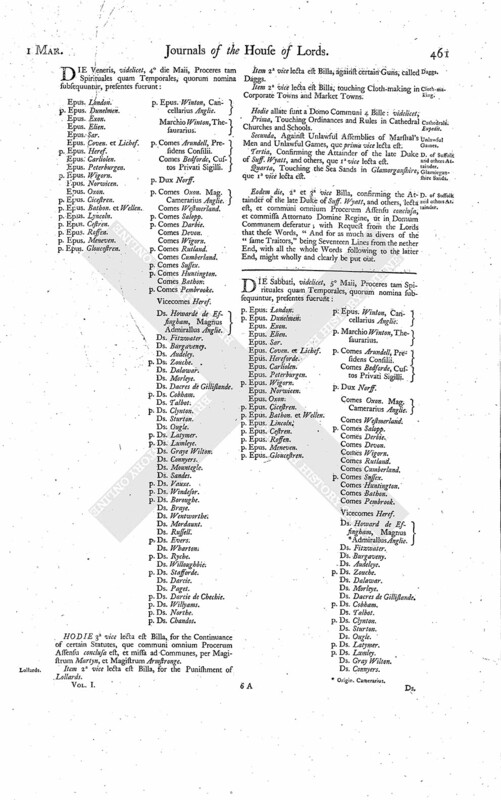 D. of Suffolk and others Attainder. HODIE 3a vice lecta est Billa, for the Continuance of certain Statutes, que communi omnium Procerum Assensu conclusa est, et missa ad Communes, per Magistrum Martyn, et Magistrum Armstronge. Item 2a vice lecta est Billa, for the Punishment of Lollards. Item 2a vice lecta est Billa, against certain Guns, called Daggs. Item 2a vice lecta est Billa, touching Cloth-making in Corporate Towns and Market Towns. Prima, Touching Ordinances and Rules in Cathedral Churches and Schools. Secunda, Against Unlawful Assemblies of Marshal's Men and Unlawful Games, que prima vice lecta est. Tertia, Confirming the Attainder of the late Duke of Suff. Wyatt, and others, que 1a vice lecta est. Quarta, Touching the Sea Sands in Glamorganshire, que 1a vice lecta est. Eodem die, 2a et 3a vice Billa, confirming the Attainder of the late Duke of Suff. Wyatt, and others, lecta est, et communi omnium Procerum Assensu conclusa, et commissa Attornato Domine Regine, ut in Domum Communem deferatur; with Request from the Lords that these Words, "And for as much as divers of the "same Traitors," being Seventeen Lines from the nether End, with all the whole Words following to the latter End, might wholly and clearly be put out.